Here at Synergy Healthcare it is inevitable that this time of the year we begin to see a spike in skiing or snowboarding related injuries. Some research indicates that joint sprains (damage to ligaments around the joint) are easily the most common injury sustained during these activities accounting for close to 50% of all injuries. Muscle soreness is another highly reported symptom on the slopes but this is usually a case of Delayed Onset Muscle Soreness (DOMS) as most of us are fairly unaccustomed to the physical stresses skiing and snowboarding place on our bodies specifically the legs. Considering joint sprains account for up to nearly 50% of all injuries on the slopes, we now look deeper into which joints are most commonly affected and unsurprisingly it is the knee with some research from more alpine countries such as Germany and Switzerland suggesting that skiing accounts for 26% of all knee injuries only behind football at 35%. The structures most affected at the knee are the medial collateral ligament (MCL), meniscus injuries (most commonly medial meniscus) 25% and the most serious is an ACL tear, reports vary in the research some claiming MCL tear is the most common others stating ACL tears have a higher incidence. If the forces are great enough the injury can be extreme with what is known as a complete blowout or the ‘terrible triad’ occurring which is damage to all of the above structures, usually a complete tear to the MCL and ACL and severe medial meniscal damage. It is highly recommended that before hitting the slopes (especially if you aren’t usually active) knee conditioning be undertaken to strengthen up the quadriceps, hamstrings and calf muscles to ensure the knee is as strong as it can be which will help reduce chance of injury. General weight training and cardio such as cross trainer or cycling will help to gear the knee up, you may even find some more specific equipment which can help condition you for skiing. Get assessed and treatment as soon as possible – this aims to keep the quadriceps as strong as possible which will help speed recovery. An assessment of ligament stability should be performed once the acute pain has settled. Soft tissue work, electrotherapy and taping will all help with injury recovery and any further referral for ligament damage or surgical repair can be made. The bindings being used can also play a role in extent of injury to the knee or ankle so ask the professionals what bindings will suit your experience level best and what some of the pro’s and con’s are. Avoid fully straightening your legs when you fall, try and keep your knees flexed. Try not to land on your hands, keep your arms up and forward. Don’t jump unless you know where and how to land, Land on both skis and keep your knees flexed. Knee bracing or taping can also help take some of the strain off ligaments and provide more stability at the joint, which can help reduce the likelihood of injury occurring. Prepare for the slopes; condition your body with resistance and cardio training, this will help reduce risk of injury and will enable a speedier recovery if you are unlucky enough to sustain and injury. If you do sustain a minor injury follow the RICER protocol, if you fear it may be something more severe get checked out! Wear a brace or taping to help provide more stability at the joint, and reduce chance of injury. 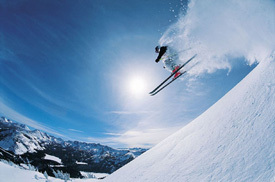 Of course there are many more injuries which can occur on the slopes, we have just focused on what it commonly presented here in the clinic; so if you have any further questions of concerns please don’t hesitate to contact us here at Synergy Healthcare on 02 9522 2125 or via email at clinic@synergyhealth.com.au.